Darts is a game that pre-dates World War I. It originated in Pubs in Great Britain when darts were crafted and thrown at a slab of wood, which, due to the nature of the wood was most commonly elm. The wood was soaked at night to “heal” the holes, and new games would begin the next day. Darts became extremely popular back then, and it is still very popular today. You can still get darts that are crafted from wood, but other materials have become the go to for professionals. 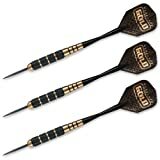 If you are looking for a new dart set, there are a lot of features that affect the way the dart is thrown and the outcome of a game. Let’s take a look at some of these considerations before you make a purchase and take a look at four different dart options that may suit you. Our gold pick, which is Harrows Voodoo Dart, is an elegant style of dart that a professional dart player would love. It comes to us from the United Kingdom, so since that is the birthplace of the game, it should be a company that we can depend on for quality products. This set comes with three beautifully designed darts that weigh in at about 25 grams a piece, which is a great weight for most dart enthusiasts to play with. These steel tip darts are really a sight to behold. The shaft of the dart is a slim plastic model that flies through the air with ease. It is coupled with a black and brass knurled barrel that gives you a great amount of control and grip over the dart as you throw it. The flight is black with Marathon Gold lettering that is sure to catch your eye. A unique feature of this flight is that it is dimpled, which means that as you throw it, the dart will slow and stabilize to hit your target on the dartboard. Our silver pick, which is the Fat Cat darts, is manufactured from GLD, which is a company that has been involved in creating gaming products such as these for over 30 years. Their products have been reliable and durable for decades, so it only makes sense that their darts would appear on our list. This purchase is actually not just a few darts; it is a barrel full of them. This can be great for when you are in a tournament where a lot of darts are needed, you break one of the darts you are currently using, or a friend simply forgot to bring their own darts. With this 21 dart package, you will never be without a dart when you are away from home again. The dart itself sports a stylish black, grey, and silver look that will mystify your opponents. Each one features a steel tip, and a shaft that is created from a nylon material and crafted into a convex shape. The barrel is a beautiful silver plated design that features knurled grips to give you a superior grip with every flight. Each of the darts weighs about 20 grams, which is a great weight for most. The flights are metro slim poly pro flights that give you an enhanced level of control when coupled with the other aspects of the dart. On each grey flight, you will see the image of a red cat that is sporting a fedora on its head, which is a unique image that will not be seen on most darts. Our third pick comes from a company called CUESOUL, who specializes in pool cues and darts, so why wouldn’t they create a quality set of darts that can have you winning all of the games you play. These steel tip darts are about 20 grams each, which make them a great weight for pros and beginners alike. There are three complete darts included in the set along with three extra dart shafts and three extra dart flights that you can use as replacements. The best part is that the set comes in a gorgeous carrying case that is perfect to put in your pocket when you head to your favorite local dart throwing location. The dart features a brass barrel that is designed with a knurled design that will give you a great amount of grip and control over the dart as you throw it into flight. The shaft is crafted from aluminum, which gives it additional durability against being broken. 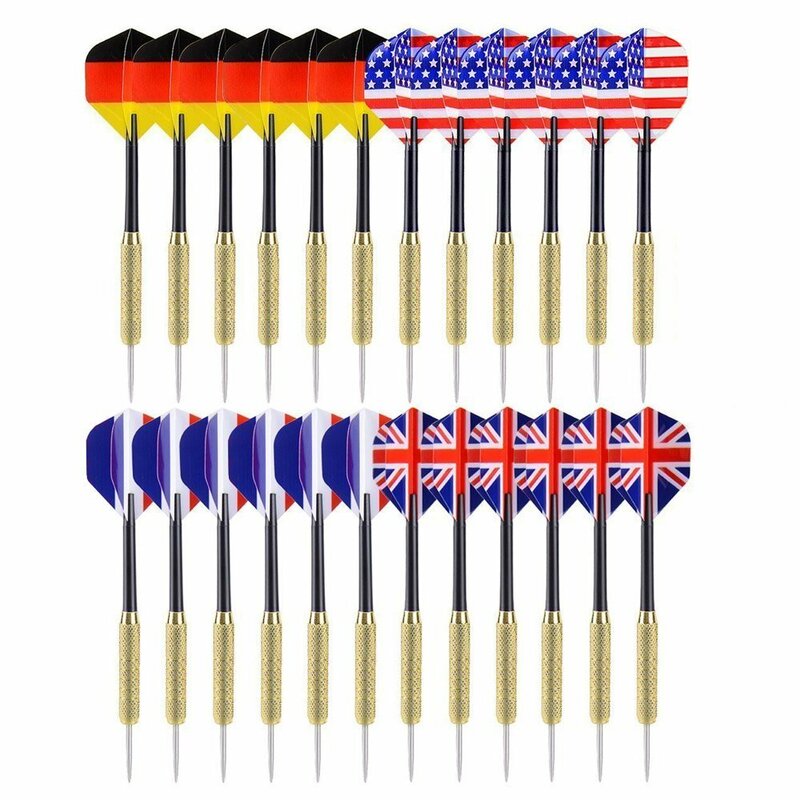 There are two sets of shafts included in the set and each of them are a different color, which means that you can change them up if someone that you are competing against has similar darts. You can also purchase more tips and barrels to accompany the extra shafts and flights to be used by a companion of someone who likes to throw darts with you often. 1. A completely silver dart with a white and gold flight. 2. A blue shaft, silver barrel, and white and black flights. 3. A black and silver dart with a black and white flight. 4. The entire dart is stripped in copper and black. 5. A light blue shaft, silver barrel, and black flights sporting the CUESOUL logo in silver print. Darts are a great game to play at home, especially if you are ballin’ on a budget. Our last pick is the Ohuhu Darts. The set comes with 15 plain black shafts that have a slight curve to their design to give you enhanced control over your flight. There are 12 copper covered barrels in this set; each of which is designed with a knurled grip that will help you maintain control over the dart. The main feature of this set of darts is the flight. There are 12 included in this set, and they are designed with four national flags on each. Each flag is represented on four of the flights. You will notice that the countries that are represented are Germany, France, Great Britain, and the United States. 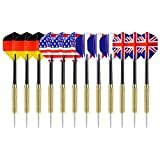 This unique feature makes these darts stand out at a competition, and if you are playing amongst friends, you can each represent a country and see which one is victorious in the end. The darts all come in a draw string bag to help keep them protected when they are not in use. Steel tip darts are designed to be used with more solid dart boards that are made from bristle or paper, while soft tips are made for a digital dart board or one that is comprised of plastic. 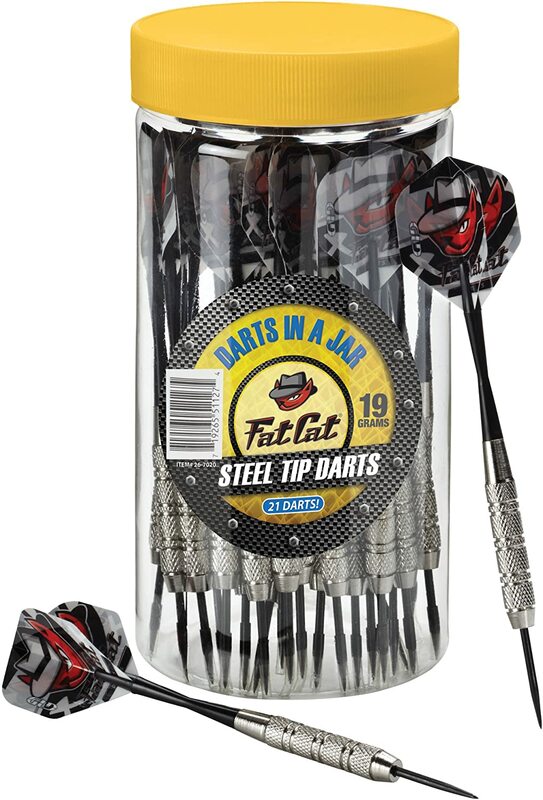 The type of darts and dart board you choose is up to your play style, but if you plan on using your darts in pubs like where the game originated, then you will most likely want steel tipped darts. Brass darts tend to be a bit thicker, which can be an advantage for a beginner to have. Tungsten darts are preferred by most professionals. The higher the percent of tungsten, the narrower the dart will be. Most darts of this style are typically 70 percent to 90 percent tungsten. • Plastic or nylon darts are for beginners. They tend to break easily when tight groups are thrown, but they work great otherwise. Often these dart shafts are very colorful. • Aluminum shafts are also colorful options, but they are much more durable than nylon ones. • Carbon Fiber shafts are lightweight, durable options that are often preferred over aluminum shafts, as they do not have the same tendency to loosen from the barrel during game time. • Spinning shafts are designed to allow you to group your darts closer together because the flights align. Flights come in different sizes and styles that may affect the outcome of your game. You can get a slimmer flight to have a more streamlined throw, or you can get a dimpled flight, which will stabilize your dart by slowing it down in the air. The flights also can sport various colors and designs, so find a style that is perfect for you. • Knurled Grip – This style features a diamond pattern that works great with hands that have a rougher texture. • Ringed Grip – This is a series of rings that are designed to prevent your hand from losing its position. • Wave Grip – A series of smaller rings or waves encircle the area that you grip. • Shark Fin Grip – This type features shark fin like patterns that give you a precise gripping location for each throw. • Micro Grip – This grip is much finer than the others, but it offers soft lines to stabilize the dart. • Precision Grip – This is the smallest type of grip, which gives you a rough surface to hold onto. This style is great for individuals who tend to have very moist hands. Most dart weights are between 12 and 50 grams; with most players prefer darts that range between 18 and 32 grams. The heavier the dart is, the less effort you have to put into each throw. The speed at which you typically throw a dart is going to be one of the deciding factors when it comes to the weight of the dart. Another factor that should be considered is the location of the weight. Do you prefer to play with a front loaded dart, or do you like the back end to be heavier when you throw darts? Test out a few different weight options to see which feels best for you. If your dart does not have a good balance, then you will not be able to hit your target with consistent accuracy. When you play darts a lot, it is good to have your own set of darts, but you also need something to play on. To make sure you are at the same skill level as your opponents at the local pub, you will need a dartboard to practice on at home. The most common type of dartboard is a bristle board, which is because the removal of a dart does not damage the board; the holes will simply close once the darts are free from the board. If you play with a soft tip, then you will need to consider a digital dartboard for your home. 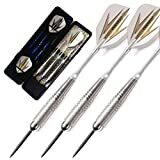 Darts is a competitive game, and there is no better way to get an edge on your competition that to have a good set of darts that will lead you down the path to victory. If the picks that we have included in this list do not fit your personal play style, then use our pre-purchase considerations to find your darts. Once you have darts that are perfect for you, it’s game over.